After Guangdong Highnic Group officially took over Zhongnan Aluminum Wheel Group, ZNA has established an research institute on aluminum-alloy auto parts and motor parts, which constantly recruits competent professionals to construct a youthful but high-quality R & D team cooperating with the original experienced talents, so as to satisfy customers’ demands and to launch more extraordinary, more vigorous and more charming products to the market. The scientific program management and advance development approaches has made a great contribution to the prospective R & D, resulting in a remarkable achievement for ZNA on product molding design, die technique, casting and formation, etc. 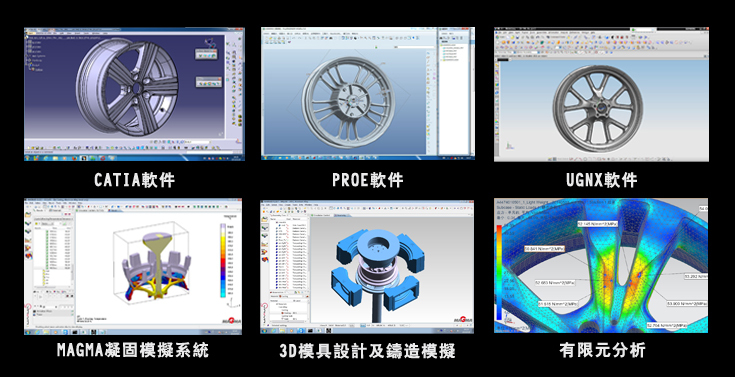 The R & D program management system based on PLM platform has been also set up, generally applying digital design which is a magnificent combination of softwares like CATIA、PROE、UGNX and data from customers, as well as project simulating technique (advanced and sophisticated Limited Meta-Analysis & casting imitation technique) . Over these years, ZNA has succeeded in developing plentiful new products for Volkswagen, Ford, Suzuki, Benz, Harley Davidson, Triumph, Piaggio, Yamaha, Honda and other famous manufacturers. It turns out that every business partner has a great sense of trust to ZNA not only for its fantastic R & D strength but also for its excellent services.